We see the demonstration today 27 january 2019 in Belgrade as a great step forward for the construction of a continental social movement for water as a common, for the promotion of the human right to water and for the protection of the environment against the selfish interests of some that want to destroy it only for their benefit. The movement to defend rivers of Stara planina (Odbranimo reke Stare Planine) is for us the same struggle that our members do in Ireland, Portugal, Spain, Italy, France, Greece, Germany, Ireland… We encourage you to continue and we support the efforts to create a wider organization for the promotion of water as a common, for a more democratic water management and for the human right to water. In that sense the creation of the group Pravo na vodu (Right to Water) makes us full of joy! Forward in the struggle and all our support! 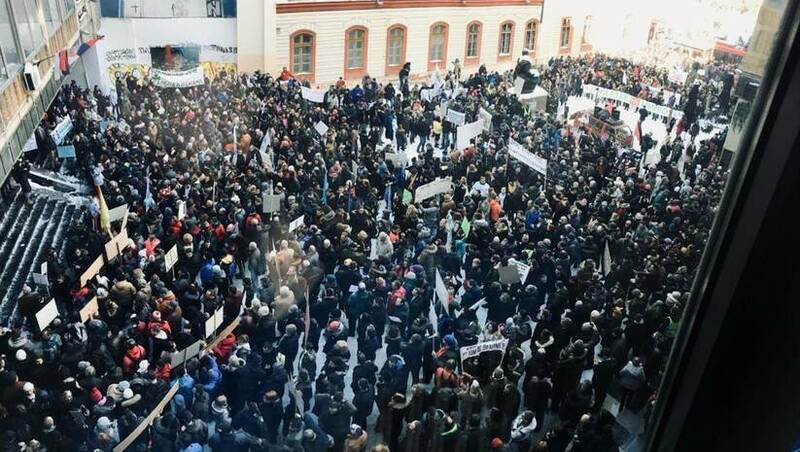 Four thousands marched on Sunday, January 27th, in capital city of Serbia under the banner “Ne damo reke” (“We refuse to give our rivers away”). People came from all parts of Serbia to demand immediate moratorium on further construction of derivative mini hydro-power plants (MHP). The largest ecological protest ever held in this country was organised by the grassroots initiative “Odbranimo reke Stare planine” (ORSP), an ever growing community which communicate and coordinate activities through public FB group with more than 80 thousand members. The vital organisational support came from couple of Belgrade-based organisations engaged in local community struggles as well as initiatives advocating for human right to water such as our initiative “Right to Water”. The number of different civil society organizations engaged in the struggle is on the rise and protest received open support of university professors, journalists and artists. The support also came from abroad – Coalition for the defence of rivers in BIH, European Water Movement, etc. – and that makes this struggle even more important since the derivative mini hydro-power plants destroy rivers throughout the Balkan. On the other hand Serbian Government remains silent, which is the usual tactic they turn to when they are being faced with the question of MHP and energy strategy. 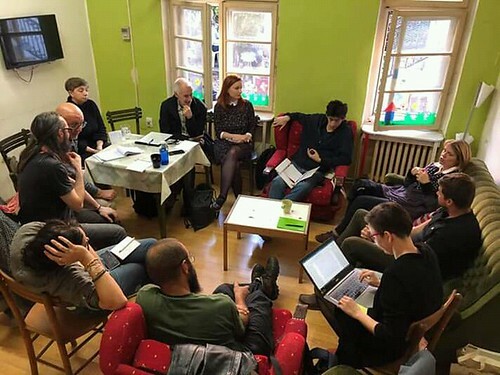 Activists from Serbia, Bosnia and Herzegovina, Slovakia, Slovenia, Italy, France and Spain participated on 13 October 2018 in a workshop co-organised by the European Water Movement and the Rosa Luxembourg Foundation in Belgrade. The main objective of this workshop was to think about how to protect the rivers and communities living nearby from dam and hydropower plant projects with high environmental and social impacts. The European Water Movement supports the call expressed by the group of citizens “Odbranimo reke Stare planine” for the preservation of the rivers of Stara Planina, a mountain in south-eastern Serbia, and other rivers endangered by the derivative type of small hydropower plants. The European Water Movement includes movements, social organizations, committees, unions from different European countries. They are united to fight against commodification of water and privatization of water and sanitation services, for water as a commons and public and communal management of water and sanitation services, founded on the democratic participation. The European Water Movement promotes a policy at European level that preserves aquatic ecosystems and water quality, and ensures access to safe drinking water and sanitation for present and future generations. It opposes any infrastructure project (dams, water transfers, etc.) that conflicts with the objectives set out above and will have a negative impact on the climate and the water cycles. The construction of derivative hydropower plants on the rivers of Stara Planina is clearly one such project. Stara Planina is a natural area of great importance in terms of biodiversity and water. These hydropower plants would not only damage rivers and the springs of clean drinkable water but will also threaten the fauna and flora that depend on them. Moreover, they would affect the quality of life of people who live along the mountain rivers. The European Water Movement supports the following Letter of Appeal with 36 other NGOs. We are addressing to you in order to gain attention and better visibility of the acute ecological problems in Serbia, and hopefully to get support from relevant international institutions. In order to achieve higher production of the electrical energy from renewable resources Serbia has started building small hydroelectric power plants in different natural sites in the country. Unfortunately, the plants projects proved to be threatening the environment, since they do not respect the regulations considering smallest amount of water necessary for aquatic ecosystem sustainability. (A lot of plants are to be built on the streams and rivers with insufficient amount of water that during the summer season turn into brooks). At this very moment, building is performed in the protected zones of the Mountain Stara planina (Mountain Balkan). This mountain is of particular value due to its drinkable water, rich biodiversity, and distinguished beauty.